As the New Year continues into February with uncertainty hovering over the CRE market, we can gain some encouragement from a historical perspective as well as by parsing general and small balance commercial real estate trends. Real Capital Analytics reported that investment sales of properties greater than $2.5 million in value declined last year by 7% to $463.9 billion as near-peak conditions caused buyers to become more discriminating about sectors, markets and financing conditions. RCA further indicated that portfolio sales plummeted by 34% YOY while single-asset transactions decreased by only 5%. The very modest contraction in single-asset sales hints at the bifurcation in trends we see between the large and small-cap CRE sales market. While RCA reported that sales in the greater investment market contracted for two years in a row, we show an opposing trend in the small-cap arena. As shown in the nearby graph, sales volume for transactions under $5 million rose to $101.5 billion in 2016 – the highest level in the post-crisis era at that time – but this year has already surpassed that record with $106.3 billion booked through November according to our proprietary research. Effervescent small-cap space market fundamentals, relatively modest gains in sales prices (at 4.7% YOY) and aggressive financing for SBL credits among other factors have supported the elevation in asset sales. In fact, you can see in the nearby graph how transaction sales and SBL originations have increased in lockstep over time. SBL volume hit a post-crisis high at $240.2 billion during 2016 as purchase loans contributed nearly 42% of total volume, representing the highest percentage in at least eight years. SBL volume for 2017 will surpass $200 billion for the fifth consecutive year but will likely fall short of the previous record based on totals through the first three quarters. 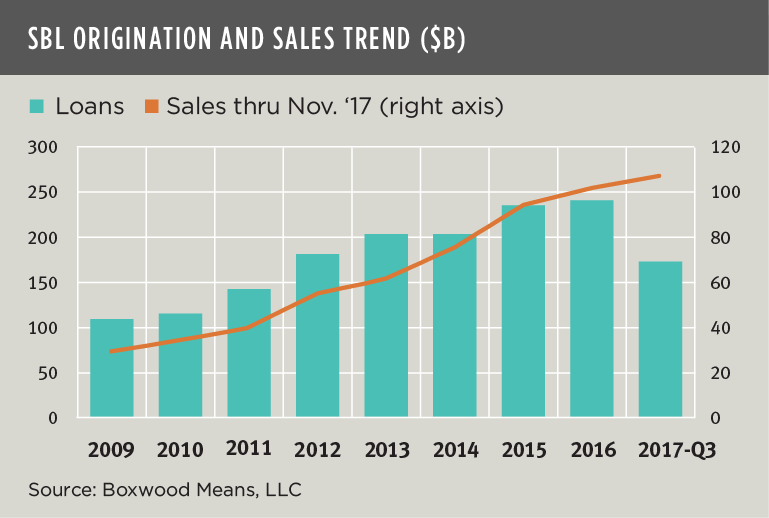 Even with the possibility of some deceleration in the small-cap CRE market’s velocity, the magnitude of sales and originations activity will remain high by historical norms even though Olympic-sized records may not be shattered again this year.